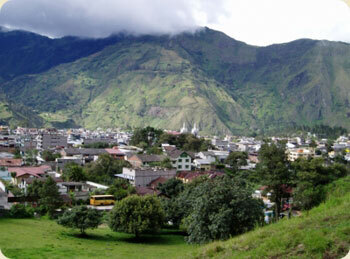 When you first drive into Papallacta Ecuador you probably wouldn't expect it to be a major tourist stop. The town itself is small and sleepy. 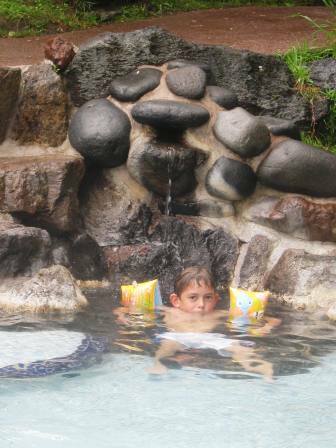 But here you will find some of the best thermal pools in all of Ecuador. Papallacta is located between the Antisana and Cayambe Volcanoes, which have heated the water. 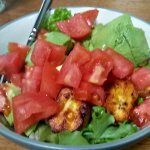 Many believe that the waters have healing benefits. We decided to take a day trip from Tena to Papallacta. The bus ride from Tena is usually around two and a half hours, but this day took over three. By the time we arrived we had all begun to think that maybe the "day trip" thought wasn't so ideal. Note: Quito to Papallacta is about a two hour trip and can be done as a day trip. The weather was cold and drizzly. For us jungle bums it seemed extra cold. Someone even compared it to Wisconsin....burr (it wasn't THAT bad). We caught a taxi to the Termas de Papallacta, the most extensive and expensive complex of pools. There are also several hotels with their own pools and a Municipal run complex ($3 adult admission), but we wanted the best of the best. 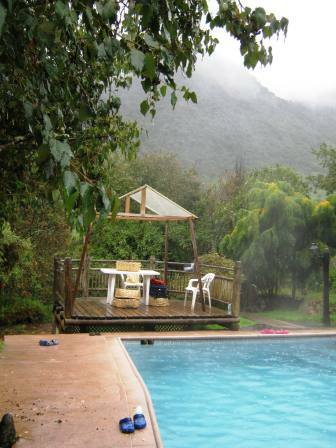 Several options are available when visiting Termas de Papallacta. You can stay the night with rooms for 1-3 people (from $140 per night) or family sized cabins for up to 6 people ($200 per night). Some rooms have their own private pools and all include entrance to the public pool complex. A spa is also on site with a rang of beauty treatments and of course more pools. The public pools ($7 adults, $3.50 children) were our choice for this day trip. We had a trout lunch before entering the complex in a small restaurant just outside the hotel entrance. As we walked to the pool entrance it started to pour rain...we were cold! After paying, we rented lockers and some pool toys (you don't need to buy pool toys if you don't have your own, you can rent water wings and floats for free-just leave a small deposit which is returned to you when you return the floats). Then we ran to change into our swimwear. One of the things I hate most about pools in Ecuador in general, is that to shower beforehand the showers are usually ICE COLD. Not here. The showers were so nice and warm you hardly wanted to leave them. We headed to a pool that only had four people in it. We found out why...the water was scorching hot. The water feeding into the pool via a small waterfall was too hot to touch. One corner of the pool was cooler, so we stayed over there. 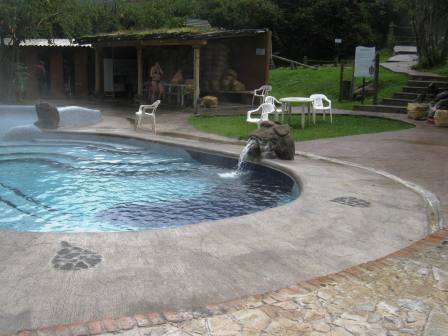 One notable difference of the Papallacta Ecuador pools vs say the Baños Ecuador pools was the color of the water. In Baños the pools tend to have a yellow tint from the mineral mix. But Papallacta's water was crystal clear. The rest of the afternoon we spent trying out the different pools. Some were super hot, others were freezing cold. Some swear by "shock therapy" where you go from the hot to the freezing cold to get your circulation going. I would rather be comfortable and not give myself a migraine. One pool we found was the perfect mix of hot and cold and it was just big enough for the six of us. The sprinkling rain and occasional sun made it the perfect combo for a day of soaking. We were so relaxed that again we wished we had made this longer than just a day trip. The thought of getting on the bus home, or in our case to Quito to handle some paperwork, just wasn't appealing. Next time we will make it more than a day trip. 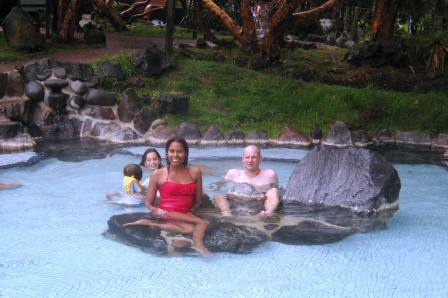 I would definitely recommend the pools at Papallacta Ecuador for a quiet day of relaxation. It's going to be my new "go to" place when I have visitors.